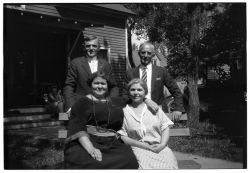 Thorwald Mohr, Emma Frandsen Mohr, Marius Rasmussen, and Dagmar Mohr Rasmussen. [S1171] Church books for Sct. Knud Parish, Fødte 1881-1884 - Christening of Christian Marius Frederik Rasmussen. [S810] WWI Draft Registration Card of Marius Fred Rasmussen, Ancestry.com (National Archives & Records Administration). [S564] Marriage License of Marius F. Rassmussen and Dagmar R. Mohr. [S592] 1920 US Census - Household of Marius F. Rasmussem. [S2192] 1930 US Census - Household of Marius Rasmussem. [S2270] 1940 US Census - Household of Marius F. Rasmussen. [S2465] Find A Grave entry for Marius F. Rasmussen, #95199955, username Goldrush. [S593] 1910 US Census - Household of Marius Rasmussen. [S38] Caption on photo in collection of Bradley Mohr.